It feels like the whole last year of my life was a dream and I never left this place. Rob went with me to the forest after breakfast. The path up there is mainly the same, except there are now plantains growing where the Costa Rican guy bought land, and a lot of trees have been cut down south of the path as you head up. Though it was late, we heard a few howls. Some were definitely to the North, but its all overgrown with Acacia and is completely impassible. So we went South where the trails have been maintained for primatology students. I could sense the monkeys all around, and finally Rob spotted a lone female. We eventually found another female and a male. It must have been the South Group, but none were individuals I recognized. The second female had a lame left arm, either paralyzed or broken. She had trouble moving but didn’t look to be in obvious pain. 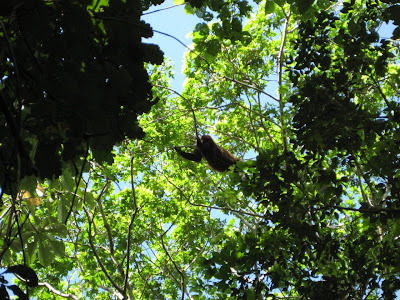 She and the male ate Laurel mature leaves and Cecropia fruit. I went wandering a bit. Trails I made have been expanded. I went to the point 40 Genizaro tree—where so much South Group action had taken place. A huge treefall that had happened in this area around July 4th, 2007, had mainly been cleared away and new vegetation was growing. While I wandered around up there, Rob saw the male and lame-armed female copulate. We left to go home and stopped by Simeon’s on the way. It was good to see him; we talked for a while. He said that he didn’t think Wrinkle Belly was living anymore because he hadn’t seen him in a very long time. He smiled endearingly and told me in a poetic way. He said that Wrinkle Belly had had a good life, with many sons and daughters and many grandchildren now. He said that Wrinkle Belly is in a place where he doesn’t have to work and he doesn’t have to worry about every being hungry. He said that Wrinkle Belly’s spirit is all around us. It is nice to think of like that, but still, I am not convinced that Wrinkle Belly is dead. I think the tough old bird may have had a few years in him yet. We got back to the hacienda and saw Reina and Argentina some more. Reina scurried to hug and kiss me, and then kept looking at me like she couldn’t believe I was really back. Later in the afternoon Rob and I went for a walk through town. We saw Jorge, who had been the former driver of the hacienda. He was the one who drove Rob and me to the hospital when Rob got sick right after we first arrived in August 2006. Jorge got fired for some reason; I’d been told it was because he’d been asked to poison some of the stray dogs (not really in his job description?) and he refused to do so. I always wondered if that was true or not. We went to Eduardo’s mother’s home, which was my only shot at finding him, since nobody else seemed to know exactly where he went. Milena didn’t look well. She was disheveled and tired, her eyes were vacant. She’d been plucking a chicken when we arrived and had little feathers stuck to her fingers. She told me that Eduardo now lives in a town called Pul, just outside of Altagracia (on the other volcano, about an hour away). She said that there had been much suffering. It was really difficult to understand her because her voice was so far away, but what I got out of it was that there seemed to be a problem with an uncle who was abusive and alcoholic. 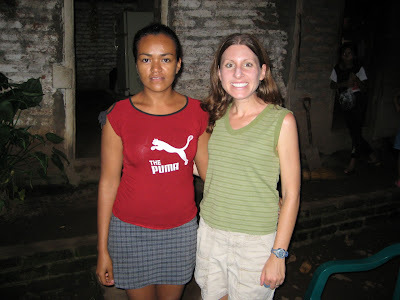 She didn’t want Eduardo around that, so he had gone to live with his grandmother and other relatives in Pul. She said she had suffered much to let him go, and her eyes filled with tears. She said she would go to Pul in the morning on the 4am bus, to tell Eduardo we were here. She said that he would come to Merida on Sunday. She said that some time ago he had told her he was coming back on a certain day and she had waited and waited for him, all day, but he had never come. When we left Milena’s house, we kept walking, and I felt like I was in some sort of dream. We went to Daraysi’s house. She was happy to see us; she brought out 3 patio chairs for us all to sit in. She doesn’t work at the hacienda anymore. She said that the work had been too hard, the hours too long. It is true, she generally worked from 6am to 9pm just about 7 days a week. She said she had become sick and anemic and had to quit. She’d gone to Costa Rica for a while with some friends, but she had come back and now she helped her mother sell sodas and chips to the school children at recess. Daraysi and Melissa. She wasn't smiling in the photo too much, but she really was happy to see us! Right now I feel as exhausted as I did after one year of research. Feel like I just can’t deal with the forest anymore, ever in my life. Feel so overwhelmed. Like I can’t face life without Wrinkle Belly and an uncertain future for Eduardo. Wondering if Milena will go find him tomorrow and if he really will come back.